This slow cooker scalloped potatoes recipe is a favorite when a side dish is needed to feed a crowd. Every family holiday you can be sure that someone will bring a slow cooker full of scalloped potatoes. Slow cooker scalloped potatoes garnished with parsley. They are easy to make, and of course, easy to transport. Plus, they stay nice and warm when served right out of the slow cooker. But what exactly are scalloped potatoes? Every time we post a recipe that involves thinly sliced potatoes, cheese and/or breadcrumbs, there is always a debate on what they should be called. 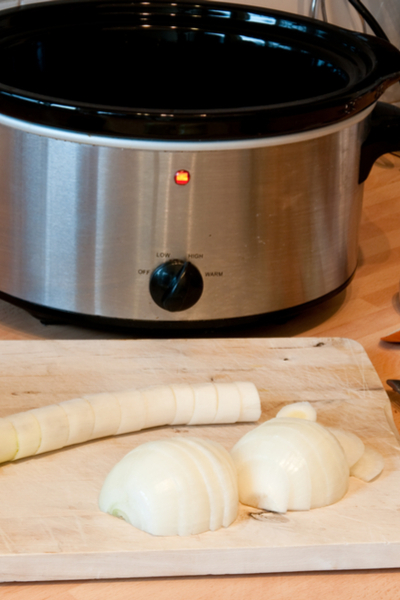 No need to saute your onions prior to putting them in the slow cooker. Are they scalloped potatoes? Or should they be called au gratin potatoes? So what is the difference between the two popular potato dishes? Although there is not a simple answer, it basically comes down to two concepts. In food terms, gratin means ‘crisply baked top’. This can be achieved either through melted grated cheese, breadcrumbs, or a combination of both. On the other hand, scalloped potatoes are thinly sliced potatoes that have been drenched in a cream sauce and topped with breadcrumbs. Whether or not they contain cheese as part of the cream sauce is up to personal preference. 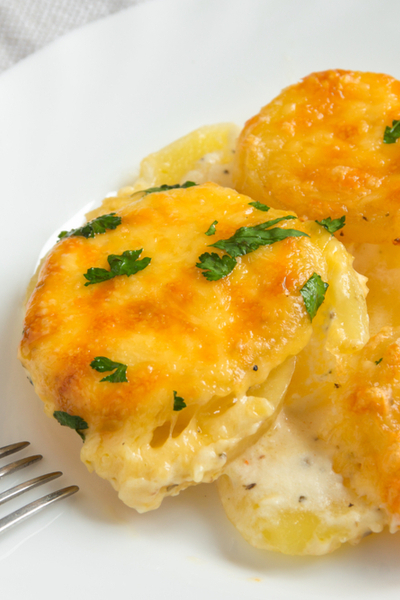 That is exactly why you fill find cheese in this slow cooker scalloped potatoes recipe! Whenever there is a chance to add cheese, we take full advantage of it! 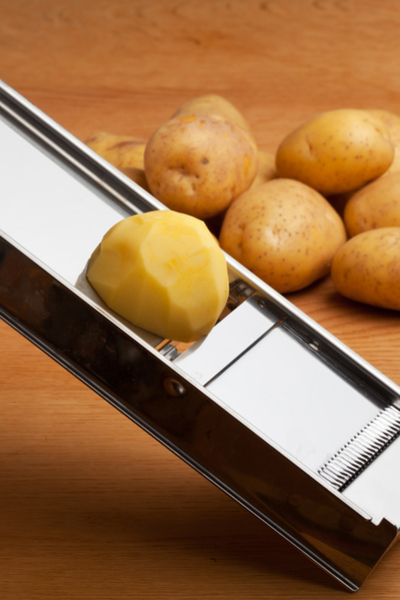 Because this recipe calls for thinly sliced potatoes, we always use our mandolin slicer. I have tried to hand cut the potatoes, but I always get various sizes that don’t cook evenly. There is nothing worse than thinking that all of the potatoes are nice and tender, but then taking a bite into a thicker potato and it be under cooked. Be sure to use the finger guard when slicing your potatoes with a mandolin slicer! Using a mandolin slicer not only eliminates that risk, but because they can be sliced so thin, the cooking time that is required is reduced significantly. But be careful!!! Please, please, please use the finger guard that comes with your slicer! I neglected to use it on more than one occasion and have sliced the tip of my thumb along with the end of the potato. Not only did it hurt extremely bad for a couple of weeks, I ruined the entire batch of sliced potatoes and I had to start over again! 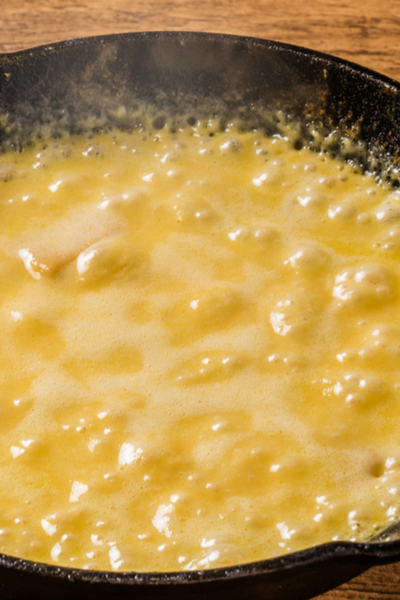 Almost all cream sauces begin with a roux base. And this scalloped potato recipe is no different. Melt butter and then add in the flour until a thick paste is formed. The cream sauce is the difference between scalloped potatoes and au gratin potatoes. Slowly whisk in the milk and as soon as it comes to a boil, reduce the heat and let it form into a thick and bubbly sauce. To prevent scorching the bottom of your pan, be sure to stir it frequently. Because I make the sauce in my hard anodized, non-stick sauce pan, I use a silicone whisk. This allows me to whisk the milk and roux together without the risk of scraping the bottom of the pan. Once it is nice and thick, add the shredded Cheddar cheese until it is completely melted. Pour it over over the potatoes and onions and it is ready to be cooked! As we discussed earlier, traditional scalloped potatoes contain a breadcrumb topping. 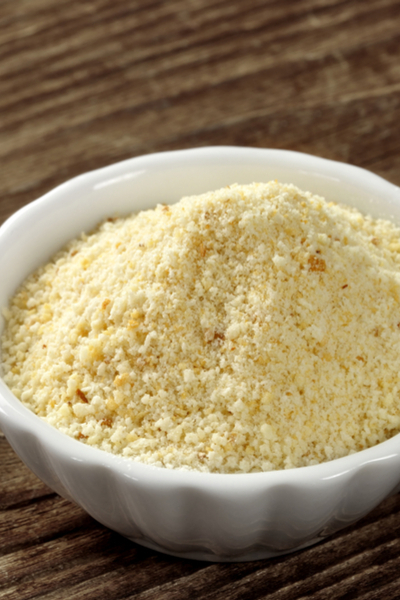 We prefer to use traditional, unflavored breadcrumbs for this recipe. This slow cooker scalloped potatoes recipe is no different. Simply add the topping at the end of the cooking process and let it continue to cook uncovered for 30 minutes. The end result – perfectly cooked scalloped potatoes that are ready to feed a crowd. 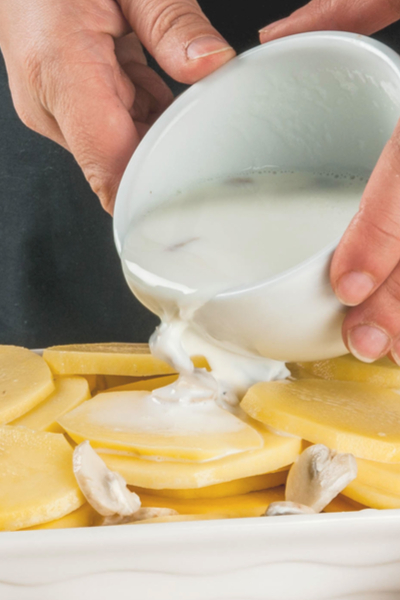 If you own an Instant Pot, check out our Instant Pot Scalloped Potatoes Recipe. Thinly sliced potatoes tossed in a rich and creamy cheese sauce, covered in bread crumbs and baked until tender. This recipe makes for the perfect side dish for any holiday or group event! Combine your potatoes and onions and place them in a 6 quart slow cooker. In a medium saucepan over medium heat, add 3 tablespoons of your butter. Once the butter has melted add the flour, mustard, Worcestershire sauce and pepper and stir until combined. Add the milk to the saucepan and stir frequently until it comes to a boil. Reduce heat to medium-low, stirring frequently, and cook the mixture until thick and bubbly. Add the Cheddar cheese and stir until the cheese melts. Pour the cheese mixture over your potatoes and toss to coat. Cover and cook on low for 5 1/2 to 6 1/2 hours or on high for 2 1/2 to 3 1/2 hours, or until the potatoes are tender. Melt your remaining 2 tablespoons of butter and combine with your Italian bread crumbs. Sprinkle the bread crumbs evenly over your potatoes. *All slow cookers cook at different rates. Please adjust the cooking time based on your slow cooker.